Does your baby need a blanket or do you need a one-of-a-kind gift for a pregnant pal? Look no further! 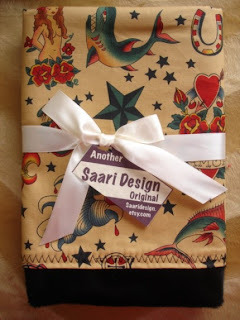 Saari Design has given us this Antiqued Tattoo Blanket to give to one of our lucky readers! Just leave us a comment on this post...you can still enter if you don't have a blog, just choose the "other" or "anonymous" button in the comment box. Just don't forget to leave us your name and email address so we know where to contact you!. It's as simple as that. One name will be chosen on Friday, August 3rd at 10PM. The minky fabric on the blanket that we're giving away is RED-my camera is acting up today, so you get the Saari stock picture (which is probably better than the one I took anyway. Check out Saari Design for all of your baby needs! This unique boutique of hand-made items has everything from custom Boppy covers to crib bedding and everything in between! Want to Win a TV?